Weakness. Coughing. Fever. Shortness of breath. These are all the symptoms of silicosis, a type of occupational lung disease caused by inhaling crystalline silica dust. It causes inflammation and scarring in the upper nodes of the lungs – and it’s a lot more common than you think. Silica, also referred to as quartz, is one of the most common minerals in the world; it’s found in a ton of materials you’ll find in industrial work environments, like soil, sand, concrete, rock, granite, and masonry and landscaping materials. When you start grinding, drilling, or disturbing these materials in some way, you create tiny crystalline silica dust particles that aren’t visible to the naked eye. And when inhaled, these dust particles embed themselves into your lungs, which can lead to silicosis, lung cancer, and lung disease. What’s worse, it only takes a very small amount of silica dust in the atmosphere to create a health hazard for your workers. 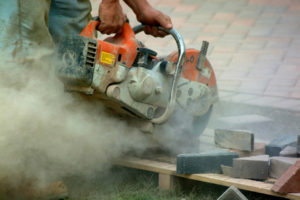 The majority of lung cancers associated with crystalline silica occur among workers in the construction industry, with a whopping 56% of reported cases. These cancers also occur in workers in manufacturing, mining, oil and gas extraction, and the transportation and warehousing industries. Under the Occupational Health and Safety Act (OHSA), “employers, supervisors and workers have legal responsibilities relating to the control of safety and health hazards in the workplace. For example, the employer must inform the worker or his or her supervisor about any safety or health hazard present in the workplace. The supervisor must advise the worker about hazards of which he or she is aware and the worker must report to his supervisor whenever he or she becomes aware of a hazard or a contravention of the Act or Regulations. b) Has the cut point of 4 microns at 50 per cent collective efficiency. If you aren’t able to engineer out crystalline silica hazards, protect your employees by providing them with fit testing for the appropriate respiratory protection at regular intervals. And under no circumstances should you allow them to exceed the maximum daily exposure limits. Need more help? Contact us today for more info.